The Go Flow Water Gravity Bag is the ultimate filtration system that is lightweight and will go anywhere you go. The simple design enables the maximum amount of filtration, while providing a convenient and uncomplicated experience. It is compatible with the Versa Flow Ultra-filtration Hollow Fiber filter. It is also compatible with other gravity style filters. Made from food-grade Thermoplastic Polyurethane Plastic (TPU) which is waterproof and strong. TPU's flexibility allows for better containment and cleanability. The quick release valve is fused into the TPU preventing leaks. Located on the side of the 10 liter storage capacity water bag, the placement allows unwanted sediments to fall to the bottom of the bag and not enter into the filter. This reduced the chances of clogging the filter. Does not include HydroBlu Versa Flow Water Filter. IDEAL OUTDOOR WATER FILTER - The Go Flow Water Gravity Bag is the best gravity filter system that is easy to use and light weight at 8.8 oz. With a quick connect hose and slide on water filter capability it is simple to setup and provides clean water with limited effort. LIGHT WEIGHT & DURABLE- The10-liter BPA-Free, food-grade Thermoplastic Polyurethane Plastic (TPU) roll top style water gravity bag with reinforced stitching is strong and durable. At 8.8 oz. it is light and will still provide clean water with connected gravity filters. An adjustable nylon shoulder strap makes water transport and filtration user friendly. 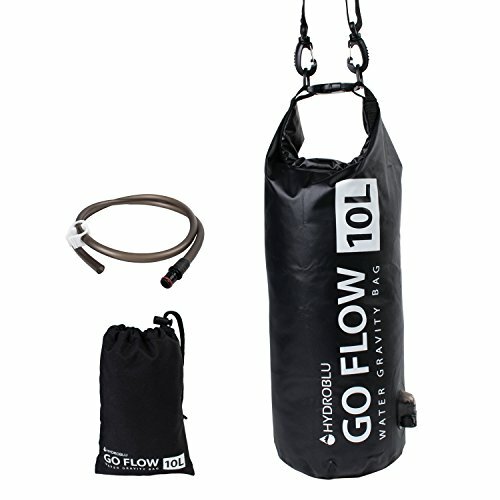 LONGEVITY & COMPACT - The Go Flow Water Gravity Bag is made of strong TPU and is tear resistance. The entire Go Flow Water Gravity Bag will fit into a 5 ½" x 3 ½" x 7 ½" carrying bag which is perfect to grab on the go for outdoor recreation. Compatible gravity water filters will fit inside the carrying bag as well. LIFETIME QUALITY - Designed in Salt Lake City, UT this Go Flow Water Gravity Bag will last a lifetime and will always be a great addition to your hiking, backpacking, emergency preparedness, or outdoor gear.